air joe is proud to serve the St. Charles community! We are proud to be a part of this community, serving your heating and air conditioning needs: air joe is listed in many directories under titles such as : St. Charles Heating Contractors, St. Charles Heating, St. Charles Air Conditioning, Heating Repair, Air Conditioning Repair, St. Charles Heating and Cooling Contractors, Rooftop HVAC Repair, Ductless AC Systems, Boiler Repair and St. Charles Heating and Air Conditioning Contractors. We are here for you whether you need furnace or air conditioner repairs, heating and cooling estimates, equipment replacement or new installation of a furnace, air conditioner, heat pump, rooftop heating and cooling or comfort products to improve the air filtration for your home or business. About St. Charles, IL - Happy to be your hometown Heating & Air Conditioning Contractor! St. Charles is an Illinois city located in DuPage and Kane counties. As of 2012, the population of this community was approaching 33,400, and as a suburb of Chicago, it is located about 40 miles west of the city. 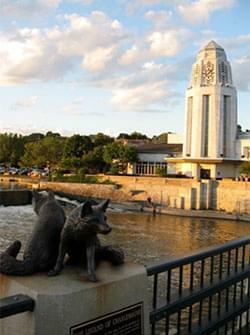 This city’s slogan is “The Pride of the Fox,” as it is named after the Fox River which runs through the town center. The climate of this region consists of four distinctive seasons with hot and humid summers and cold, snowy winters. St. Charles is home to a variety of attractions that might appeal to residents and visitors. Theater enthusiasts may enjoy a night out at Steel Beam Theatre or the Arcada Theatre. Other popular destinations in the area include the Otter Cove Aquatic Park, the Beith House Museum, and the Kane County Fairgrounds.